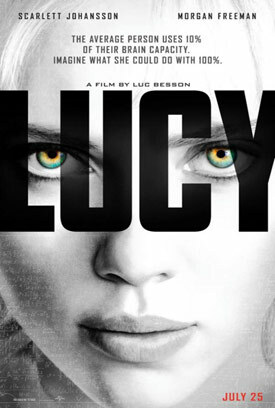 Scarlett Johansson and Morgan Freeman star in the sci-fi actioner Lucy, directed by Luc Besson (La Femme Nikita). Watch the movie trailer and view the movie photo below. Lucy (Johansson), a woman living in Taipei, Taiwan, works as a drug mule. When Lucy accidentally swallows her cargo, the drug changes her into a metahuman. She can absorb knowledge instantaneously, move objects with her mind and can’t feel pain. MPAA Rating: (R) for strong violence, disturbing images, and sexuality. From “La Femme Nikita” and “The Professional” to “The Fifth Element,” writer/director Luc Besson has created some of the toughest, most memorable female action heroes in cinematic history. Now, Besson directs Scarlett Johansson in Lucy, an action-thriller that tracks a woman accidentally caught in a dark deal who turns the tables on her captors and transforms into a merciless warrior evolved beyond human logic.